We have currently reviewed 9 AKG headphones. They're a well-trusted brand that typically focuses on great audio reproduction and mid-to-high-end open headphones. We have a few AKG headphones reviews planned throughout the year, and we will continue to update you on any new headphones that we test. Great Open-Back Models. AKG has a lot of open back models that are ideal for critical listening. They are typically comfortable headphones with a well-balanced and spacious sound at a relatively affordable price compared to the competition. Above-Average Sound Quality. Most of the AKG headphones, closed or open-back, tend to score well on our sound tests. They're not the stylish-looking or well-built type of headphones, but they more often than not deliver in the sound department. Mediocre Noise Isolation. AKG does have a few standout headphones that isolate well, but overall, they don't manufacture a lot of noise-canceling headphones, and the cheaper models do not block ambient noise as well as the competition. Lack of Diversity. AKG has a decent line up for most use cases, but do not have as many varied options as some other brands, especially, for sports-oriented headphones. Overall, AKG is a well-trusted brand when it comes to delivering high-quality audio in a comfortable design. 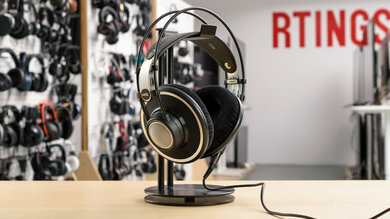 They're relatively affordable, especially considering the level of audio fidelity they deliver, but they don't offer as many varied options for their headphone selection. While we have yet to test AKG's full line-up, their choices are a little scarce notably for noise canceling and sports headphones. AKG is known for making good critical listening headphones. They have a few popular models in their line-up, and most fall under the K series, which covers both open and closed-back headphones. They don't have as many varied options as some of the other brands, but we also haven't tested the full scope of their line-up yet. K = Open or closed headphones, designed to deliver great and balanced audio quality. K-NC = Closed-back headphones that isolate well in loud environments. N = The premium line-up consisting of various types of high-end headphones. Y = Affordable, mostly closed, in-ear headphones for casual use. The best AKG headphones for audio quality are the K702. They are the best value for audio quality that we've measured from AKG so far. They deliver a comfortable listening experience and an excellent audio reproduction with a spacious soundstage. They sound as good as the K712 Pro but they're a lot cheaper, so if you want the best audio quality from AKG, then get the K702. The best AKG headphones for mixed usage are the N700NC. They have a great sound that makes them good critical listening headphones and the nice ANC features lets you focus on your audio content. 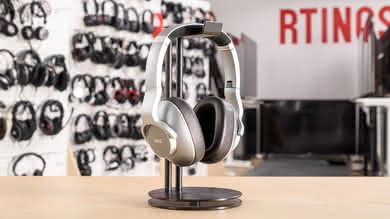 this makes them versatile enough for commuting and critical listening although their noise canceling is not as strong as some of the other noise-canceling headphones we've tested. AKG is a well-known brand which offers affordable headphones that deliver in the sound department. Their iconic open-back models outperform the competition, but they're not as sturdily built. They also don't have the widest variety of headphone options, especially for sports or loud environments, but even their budget models produce a well-balanced sound that will satisfy most listeners. Discover our recommendations for the best open-back headphones.